City Services and Infrastructure have to be constantly maintained, but they can be expensive. 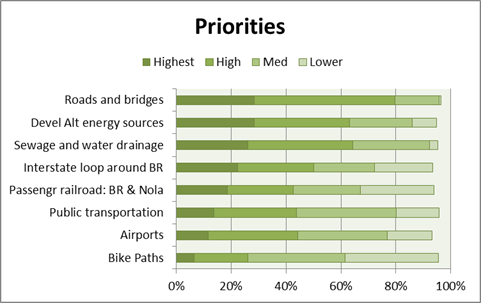 Which of the following projects do you think should have the highest priority, even if they required higher taxes to pay for them? or only some of the time?" How about state government. How much of the time do you think you can trust the Louisiana state government to do what is right -- just about always, most of the time, only some of the time, or almost never? 336. How much of the time do you think you can trust the local government here in Baton Rouge to do what is right -- just about always, most of the time, only some of the time, or almost never? To what extent do you agree with the following statement: I trust Mayor Holden to look out for the interests of people like me. City-Parish government has limited resources and has to set priorities. All of the following issues are important, but if the city cant do everything, which issues do you think should have the highest priority?